I read the fourth one in the Murder Most Unladylike series while I was away on holiday. I've had it for ages but just not picked it up. I've read the fifth one in the series, so to go back in time jolted me a bit but if there were spoilers in the 5th one I had forgotten them by the time I picked this one up. 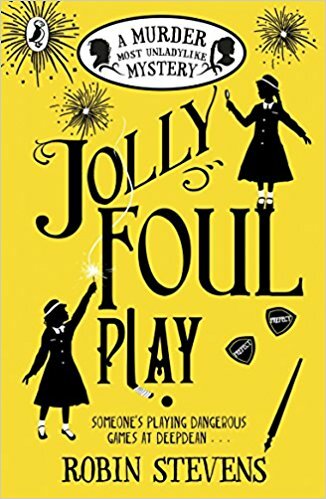 This book sees us in the winter term at Deepdean, when Hazel, Daisy, and their friends are fourth formers. There's a new Head Girl, Elizabeth, and five of her friends as prefects. The six of them are terrorising the younger years, handing out punishments left, right and centre. Then on Bonfire Night, the whole school is on the playing fields when Elizabeth is murdered. It's made to look like an accident, but Hazel and Daisy soon realise it isn't. The school headmistress, though, believes it is an accident and sacks the caretaker. 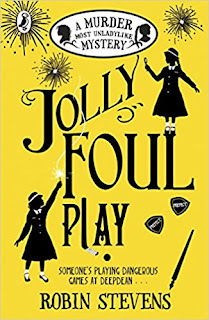 Daisy and Hazel enlist the help of their dormmates Kitty, Beanie, and Lavinia to uncover the mystery and track down which of the Five prefects murdered their friend. Meanwhile, Hazel writes secret letters to Alexander, who she met on the Orient Express in the previous book, and tells him about the case. Daisy is getting quite jealous of Hazel's friendship with a boy, driving a wedge between her and Hazel. I found Daisy quite annoying here, actually, and I was a bit frustrated when Hazel immediately forgave her after a brief conversation. But that may be my adult head looking at a book not meant for me! This is a really lovely addition to the series and perfect for any middle grader from around ten years old. I know if I was ten I'd be all over these books like a rash. They're so much fun. You can see my reviews of all the books in the series here.